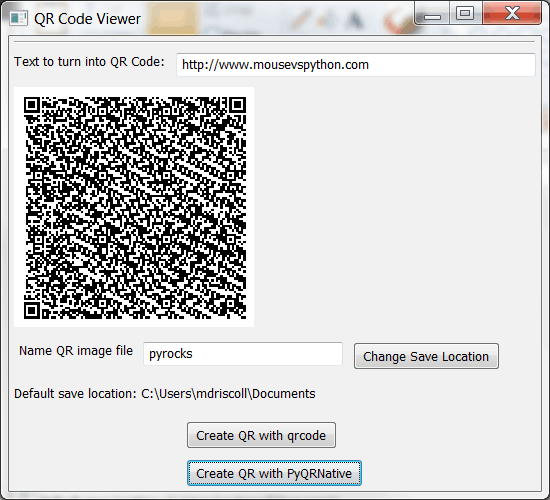 I tried python-qrcode and pyqrnative since they worked on Windows as well as Mac and Linux. They also didn’t require anything except the Python Imaging Library. The pyqrcode project requires several other prerequisites and didn’t work on Windows, so I didn’t want to mess with it. I ended up taking some old code based on my Photo Viewer application and modified it slightly to make this a QR Code viewer. If I’ve piqued your interest, then read on! As I noted at the beginning, you will need the Python Imaging Library. We’ll be using wxPython for the GUI part, so you’ll need that as well. And you’ll want to download python-qrcode and pyqrnative. The main difference I have found is that python-qrcode is much faster at generating the images and it generates the type you’ve probably seen the most of. 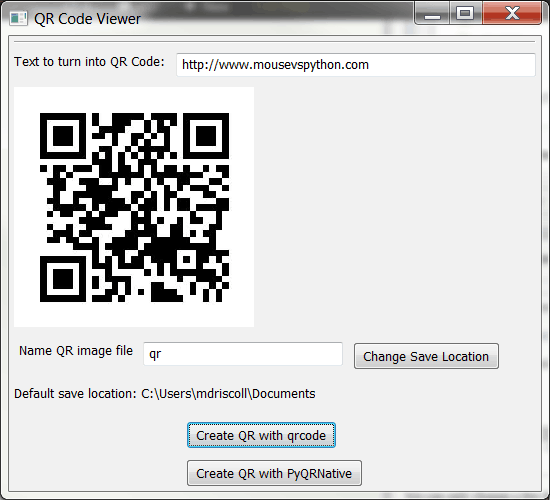 For some reason, pyqrnative take a lot longer to run and it creates a much denser looking QR code. There may be options for both of these projects that allow you to generate different kinds of codes, but the documentation for either project is abysmal. I ended up using the source and Wingware’s IDE to traverse the code more than anything else. instructions = "Name QR image file"
I tried scanning both images with my Android cell phone’s barcode scanning application and both QR codes were read correctly by it. So if you’re in need of generating QR code images for your project, I hope one of these projects will fit your needs!